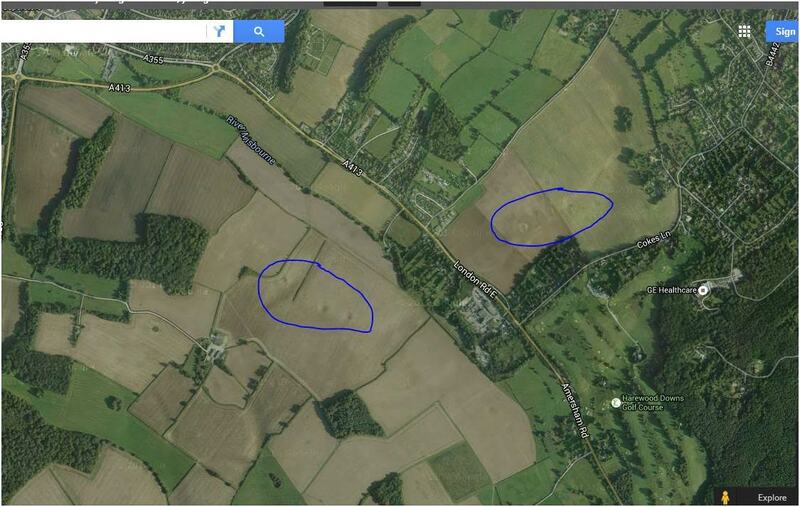 HomeMystery Amersham Craters – Anyone Know What they Are? There are no features on the 1876 6 inch OS map. I agree that they don’t look like bonb craters and they also seem small for clay diggings. Sinkholes perhaps? Thanks for the reply. Sinkholes could be it, there was a spate of them in the area recently. 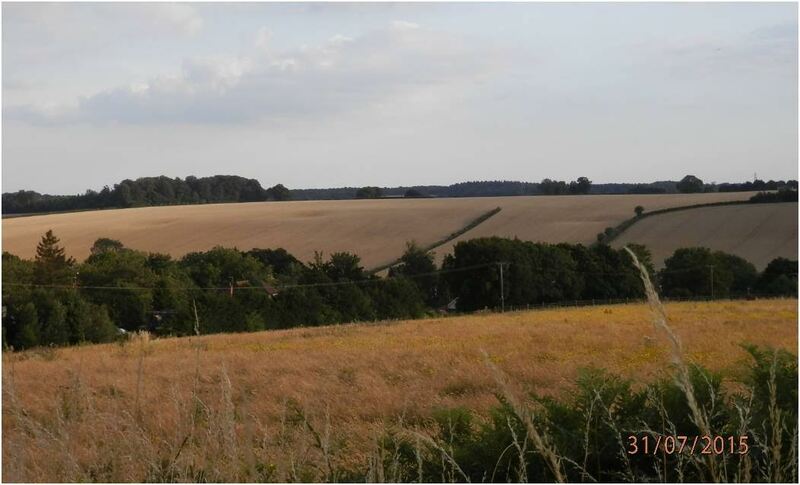 The ones near Quarrendon Farm don’t related to any trees or hedges shown on the 1876 6 inch map. The line paralel to Cokes Lane follows a slight depression which was also a field boundary. However the holes seem to me to be slightly off the line of this. Thanks for the map, no detail around Quarrenden Farm, possibly old fence post holes, timbers rotted and soil fallen creating wider depressions, they do appear to be spaced evenly. It might well be ww2 bombs. They often dropped unused bombs after coming over from London and wanted to lose the weight before heading back. I read recently about a line of bombs from Hervines park, via Challenors school to sycamore road. And there were a line of bombs near nightingales lane nearby, which are now a line of dips filled by trees across the fields. You can see them here on the bombsite map, unfortunately the map ends at chalfont, so you cant quite see if the holes in your picture are on there. I was told when I first moved to Amersham in 2001 buy a resident who was very old that they were in fact bomb craters from WW2 when a returning Lancaster accidentally dropped the remainder of his load over amersham, they can also be seen in the woods near Stanley Hill cemetery. Also a German bomber crashed near the top of Stanley Hill. I was born in 1938 and I remember when I was about four I had been for a picnic on Hawridge common when a doodle bug came over chased by either a spitfire or hurricane trying to down it. I remember the motor cutting out and it going into a dive and disappearing from view and it seemed quite a while before we heard the bang. At first we thought it was a dud, but then there was this almighty bang, which I wasn’t used to, and I left the seat on my mothers’ bicycle by quite a few inches. I don’t remember any other bomb instances which looking back was strange, but lucky, considering how close we were to Bovingdon aerodrome. I will never forget the sound of the air raid siren up Pond Park though, especially when it sounded in the night. I can’t imagine how kids [and adults] in London and other cities coped with being bombed day after day, it must still live with them.